Can a G+ post have a life of it’s own? Looks that way. 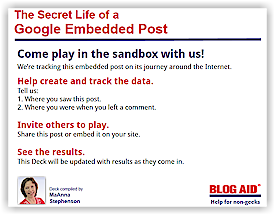 On September 10, 2013 I embedded a Google Drive Deck into a blog post and then posted about it on G+. It went crazy. The volume of shares and comments made it nearly impossible to keep up with where folks were seeing and commenting on it. That’s the purpose of this post. And you are invited to play! I’ve created a new Deck and embedded it below. Then, I shared it on G+. 1. Where you saw this post. 2. Where you were when you left a comment. Share this post or embed it on your site. This Deck will be updated with results as they come in.